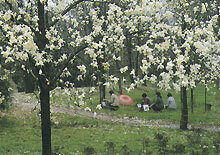 The Hangzhou Botanical Garden it a 230-hectare affair in the northwest part of the famed West Lake Scenic Resort. With a total of 3,400 plants, the garden is built on a stretch of hillside, where the weather it mild. and the vegetation is lush and verdant. Horticulture. research and education are closely integrated in this garden, which is also a popular tourist resort.